Sister Whitney, Second Counselor: Let’s call it the Nauvoo Female Relief Society. Elder Taylor: Actually I think it should be the Nauvoo Female Benevolent Society. Joseph Smith: Sound good to everybody? Let’s vote on it! Emma Smith: Actually, no. Elder Taylor, I want to argue with you about that wording change. Joseph Smith: Woooo, doggy! Is my wife sassy or what. Everyone, forget that last vote. Emma Smith: You fools. When people hear benevolent, they think of the Washington Benevolent Society, which is super corrupt. Do we really want people to have that kind of name association? Joseph Smith: Oh ho ho! Excellent point. Let’s talk more about this, ladies, and gentlemen who clearly belong in discussions of this FEMALE society. Sister Cleveland, First Counselor: We should not talk like our enemies!!! Emma Smith: We are going to do something extraordinary. Elder Taylor: Okay FINE I admit it, ya’ll probably can actually handle this on your own and I should shut my man self up and let you get on with it. Sorry I objected in the first place. 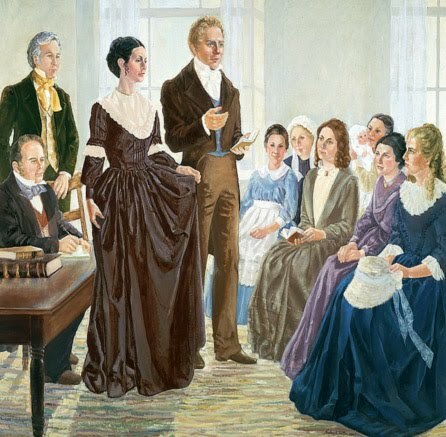 Sister Whitney: Okay, so after that little interruption… I repeat: We’ll call it the Nauvoo Female Relief Society? Eliza R. Snow: I think Female Relief Society of Nauvoo would sound better. Joseph Smith: Sound good to everyone? [everyone agrees] Bueno! Now I’ll organize you under the priesthood and after the pattern of the priesthood except no one will remember that I did that. Oh well. YOLO! If you enjoyed this summary, you might also enjoy reading how D&C 132 came about. Loving this. Please continue. It’ll be way funnier than Daughters of my Kingdom. You stole this summary from The Friend, didn’t you?